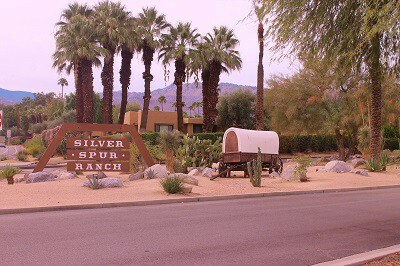 Silver Spur Ranch in South Palm Desert, CA. Silver Spur Ranch, once home to Bing Crosby, was developed in the 1950’s and 60’s and is adjacent to The Living Desert and its many hiking trails. It is also an easy golf cart ride away from Ironwood, Marrakesh, The Vintage and The Reserve Country Clubs. Located in a choice part of Palm Desert known as South Palm Desert, Silver Spur Ranch is within walking distance upscale El Paseo shopping . . . and is not far from the McCallum Theater and the valley’s only shopping center. This well maintained and upgraded community is a great find for those seeking mid-century modern design, breathtaking views of the Santa Rosa and San Jacinto mountain ranges and a serene backdrop for their desert lifestyle. Silver Spur Ranch offers a range of architectural styles from modest cottages and Mid Century Modern homes to Contemporary and Spanish style as well. Families covet this neighborhood as it is located in the highly desirable Desert Sands Unified School District with Washington Charter School within walking distance. Los Angeles, San Diego and many other major Southern California cities are within close driving distance from Silver Spur Ranch. It is conveniently located about a 30 minute drive to access the I-10 freeway and the Palm Springs International Airport. Silver Spur Ranch is highly sought after real estate because of its prime South Palm Desert location, close proximity to so many amenities, desirable school district, interesting range of architectural styles, and phenomenal hillside locale with sweeping mountain views in all directions. Silver Spur has a vibe that is all its own, with a covered wagon sitting at its landscaped entrance off of Portola Avenue. Recent home values range from approx. $200,000 to approx. $1,200,000 and HOAs in this non-gated community are low at $100/year. Location: South on Portola Ave. from El Paseo, first right after Haystack Dr.